Brow grooming is an important part of my makeup routine and one which I rarely miss. My brows appear quite full but they're a little sparse at the front and a little on the arch, so I do need a little helping hand to achieve a fuller brow. 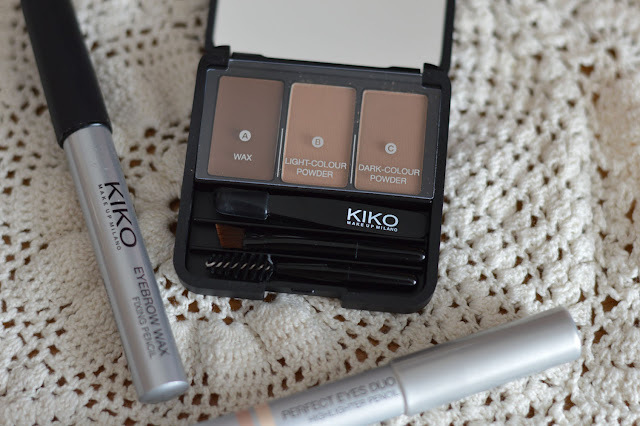 I have featured the new brand KIKO before on the blog and I'm very happy to feature them again. This is definitely a brand to try and take a look at, good quality and priced accordingly. Today I want to show you the Eyebrow Expert Styling Kit 02 (£13.90)*, a versatile kit containing lots of gems. This kit will enable you to pluck, shape and style your brows. There's a tinted wax which has a double benefit, whilst it fixes brows in place it also fills them with a hint of colour. The kit also contains two powdered shadows, both light and dark. That's not all folks, the kit also contains a trio of grooming tools which are all fab. The mini tweezers are great for keeping brows tidy, the mini spoolie is a god send for unruly bushy brows like mine. Lastly the slanted brush allows you to fill brows in with precision, this kit is a must for brow fanatics. The black simple packaging lends itself to being travel friendly. KIKO have more brow grooming products which are equally great, the Eyebrow Wax Fixing Pencil (£5.90)* is totally new to anything I've seen before making it unique. A chubby wax pencil enriched with vitamin E and Aloe Vera. The formula dries quickly and invisible without leaving a tacky residue. If you have unruly long brows this pencil could be your saviour, my brows need some type of wax or clear gel to stay in place. The wax pencil helps brows stay in place all day long with just one easy sweep. This has made its place in my makeup bag along with the Expert Kit. Last one to mention is the KIKO Perfect Eyes Duo (£6.90)*. Out of all 3 products featured this is probably the one which doesn't excite me as much. I think partly because we've seen this double duo product before. Having said that if you like to highlight your arch and brighten your eyes with the help of a highlighting pencil this could be perfect for you. Do your brows need a helping hand?